Tested, vetted and used by Commercial, Military and Corporate aviation and marine clients, ToughGuard® offers maritime customers the same protective benefits these clients have come to rely on and trust for over 3 decades. Unlike some of the competitor’s products, ToughGuard® contains no silicone or Teflon by-products. The clean Nano Technology in ToughGuard® chemically creates a superior bond with the gel-coat and paint. This bond forms an extremely durable protective barrier that lasts for years. A one-time application of ToughGuard® deepens and enhances the color and luster of paint for years–not weeks or months, but years–guaranteed! Scientifically proven, the ToughGuard® coating smooths out painted surfaces. By smoothing out the surface, dirt and other contaminants lose the ability to adhere to the ToughGuard® treated surface. Figure 1: 3D profile of painted surface BEFORE ToughGuard®treatment = 132 nmreated surface. 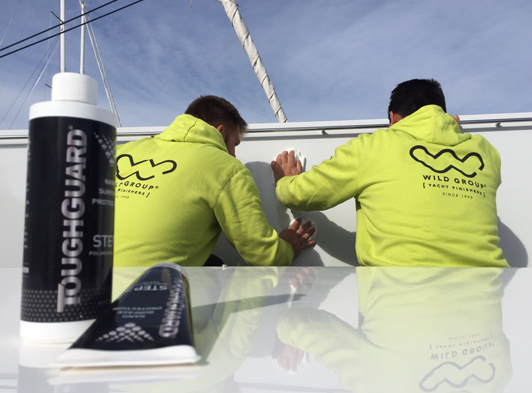 • Creates thermally stable barrier coat that prevents salt crystals from bonding to the gel-coat or paintwork finish of the hull. The ToughGuard® Company is committed toinvesting significant resources toward Research and Development with the goal of providing our customers with the industry’s best performing product. ToughGuard® is constantly exploring new ways to improve our current product line as well as developing new products. ToughGuard® is engaged with one of the world’s most advanced Nanoscience research laboratories along with several other highly credentialed testing facilities across North America. Coordination and collaboration of our R&D efforts is headed by a world renowned coatings researcher who is responsible for many U.S. patents in the field of chemical coatings. Our commitment to product improvement and new product development ensures customers the most cutting edge products available for today and in the future.